Ali Abdullah Saleh said on TV that he would be ready to "turn the page" if the coalition lifted a blockade on northern Yemen and halted its attacks. The coalition praised his offer but Houthi rebels, his allies until this week, accused him of a "coup". 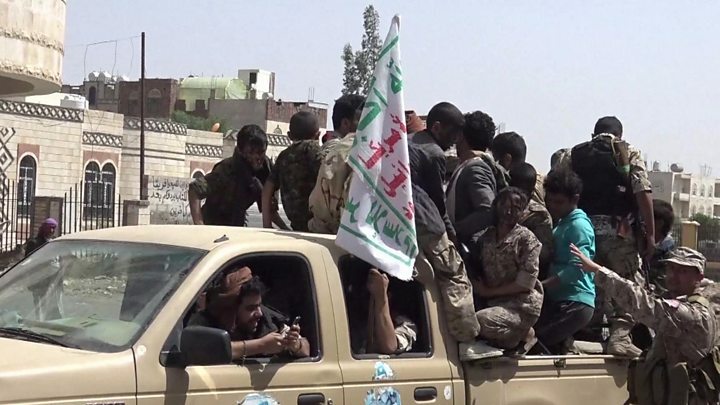 Clashes between Mr Saleh's forces and Houthi fighters broke out on Wednesday. The Red Cross tweeted that dozens had been killed in the fighting, and hundreds injured. The Houthis are backed by Iran but have been Mr Saleh's allies against the internationally-recognised government since 2014. There were reports of further fighting on the streets of the capital, Sanaa, on Saturday. Explosions and gunfire were concentrated in the southern suburbs of the city, where relatives of Mr Saleh live. The rift between forces who had been fighting side by side could have significant implications for Yemen's civil war. Who is Ali Abdullah Saleh? The authoritarian leader of Yemen for more than three decades and inextricably linked to it throughout, Mr Saleh was overthrown six months after anti-government protests began in Yemen in 2011. He then formed an alliance with the Houthis and together they took over part of the country including the capital - but after the two groups split earlier this week, he called on his supporters to revolt against Houthis. "I call on our brothers in neighbouring countries... to stop their aggression and lift the blockade... and we will turn the page," Mr Saleh said in a TV address. He condemned the Houthis for a "blatant assault" on members of his party, the General People's Congress. In a statement, the coalition said that the decision to "take the lead and to side with their people will free Yemen of... militias loyal to Iran". But the Houthis were less open to Mr Saleh's idea. A spokesman said: "Saleh's speech is a coup against our alliance and partnership... and exposed the deception of those who claim to stand against aggression." The two groups had been fighting the government of current President Abdrabbuh Mansour Hadi together for nearly three years under an uneasy alliance. Clashes erupted when Mr Saleh's supporters accused Houthi rebels of breaking into the city's main mosque complex. Will Mr Saleh's offer lead to peace? As Mr Saleh's alliance with the Houthis falls apart, he is trying to present himself as a unifying figure but it could go either way, according to Adam Baron, a Yemen analyst at the European Council on Foreign Relations. Speaking to the BBC World Service's Newshour programme, he said the move could "create a new front in a civil war that already has numerous fronts". Three previous UN-brokered attempts at peace talks have failed. The conflict has its roots in the failure of a political transition supposed to bring stability to Yemen following an uprising that forced its long-time authoritarian president, Ali Abdullah Saleh, to hand over power to Mr Hadi, his deputy, in 2011. Mr Hadi has struggled to deal with multiple problems in the poor and politically-split country, and the Houthi movement took advantage of his weakness to take control of their heartland, northern Saada province and around. Disillusioned with the transition, many ordinary Yemenis supported the Houthis and in September 2014 they entered the capital, Sanaa, setting up street camps and roadblocks. The president escaped but, alarmed by the rise of a group backed by Shia Iran, Saudi Arabia and eight other mostly Sunni Arab states began an air campaign aimed at restoring Mr Hadi's government. The coalition received logistical and intelligence support from the US, UK and France. More than 8,670 people have been killed and 49,960 injured since the coalition intervened, according to the UN. The conflict and a blockade by the coalition has also left 20.7 million people in need of humanitarian aid, created the world's largest food security emergency, and led to a cholera outbreak that is thought to have killed 2,211 people since April.